“Vietnam is trying to reform to become the number one destination for investors in Southeast Asia and the world,” said Minister of Planning and Investment, Mr. Nguyen Chi Dung,at the ASEAN Business Summit 2016. As a percentage of GDP at 6.3%, Vietnam has been attracting more than five times the Foreign Direct Investment seen in China or India over the last 5 years. Expect huge investment in the next decade in next-generation manufacturing across a wide range of industries. Wall Street Daily has some summary comments about the possibility of attracting the investment in Vietnam, in which the labor cost is considered for a decisive competitive advantage, following by the tremendous opportunities for market reforms to unlock blocked potential to drive its industry forward. Vietnam’s National Wage Council has decided upon a modest 7.3 percent average increase in monthly minimum wages across the country for 2017. This decision is considered as a compromise between the employers’ proposed increase of 5 percent and that of workers which pushed for an 11 percent increase. The decision also seems to be in response to competition from fellow manufacturing powerhouses in the region and hence primarily an effort to maintain its attractiveness to foreign investors and businesses (according to Vietnam Briefing). According to World Bank economist Sebastian Eckardt: “Vietnam may lose its competitive edge in the manufacturing sector as well. One of the challenges is raising wages, while productivity still lags behind. Vietnam labor productivity is growing at an annual rate of 4 per cent, well behind wage growth”. Mr. Pham Binh Minh, Deputy Prime Minister, said: “In the years ahead, labor cost might become unsustainable due to the increasing role that labor unions play in minimum wage legislation and the mounting expectations of workers within the country. Vietnam must create a knowledge-based labour force with skilled workers if it is to continue attracting foreign investment. The country needs a new growth model that focuses on quality, labor productivity and knowledge”. 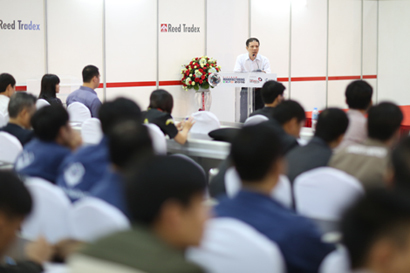 With more than 10 years of experience doing business and research about market insight and manufacturing industry in Vietnam, Ms. Kasinee Phantteeranurak, Project Manager of Reed Tradex said: “The fact from many surveys and reports has showed the opportunities for Vietnam and Vietnam’s manufacturing industry to attract investment and expand its scale. According to the World Economic Forum’s Global Competitiveness Report 2015-2016, Vietnam ranks 56th, made long strides when it jumped 12 places from 68th position in report 2014-2015. Among the 12 measures of competitiveness, the market size shows the best ranking at 33th. The macroeconomic environment (69th) is made long strides when it jumped 12 places from 68th position in report 2014-2015. Among the 12 measures of competitiveness, the market size shows the best ranking at 33th. The macroeconomic environment (69th) is continuously improving, while infrastructure (76th) and public institutions (85th) are strengthening. Notably, one of the competitiveness which is considered as advantage of Vietnam is labor force has slipped to no 52 of ranking comparing with last year at 49th. The degree of business sophistication is still low (100th), with companies typically operating toward the bottom of the value chain. A need for skilled workers is considered as “new growth model” for Vietnam’s economy in general, and manufacturing industry in particular. Getting ready for next level of competitiveness for Vietnam’s manufacturing industry, with mission as a professional trade promoter and opportunity provider, Reed Tradex – the Asean’s leading exhibition organizer is preparing the specialized exhibitions and conferences to provide Vietnamese industrialists with excellent opportunities to get face-to-face with the latest innovations, new knowledge and trends, coming along with business networking opportunities.